Born in Tycho City, Luna, young Will’s life growing up was no different than any other boy in the Federation. He went to school, played with his friends, had crushes, and eventually graduated from school. He wasn’t sure what he wanted to do at first, so his first job came as an outgrowth of a hobby: instead of working on small models he worked on the shuttles that ferried people and material between Earth and Luna. A few months into the job Will had a long talk with a Starfleet engineer that had been brought in on a consult by the management. Seeing his potential, the engineer managed to convince Will to apply to the Fleet. He nearly signed on as an enlisted crewman, but his parents were able to get him to send an application to the Academy. 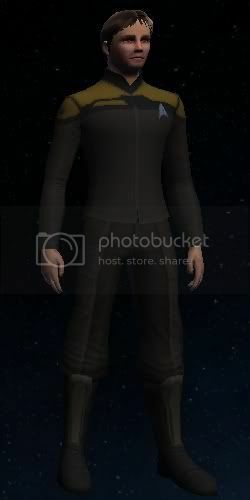 Despite his misgivings, he was accepted and stepped into the boots of a Starfleet cadet for the first time in January 2394. His first two years at the Academy were a little hectic thanks to this arriving a semester late, but he applied himself well and got caught up with his peers. His experience with the shuttles came in handy, his on-hands knowledge giving him a leg-up in several of the engineering labs. At the end of the 2397 school year, Cadet Walters became Ensign Walters and was assigned to the USS Enzio, Section 47 as her new Chief Engineer.